A truly stunning collection of wedding garters. 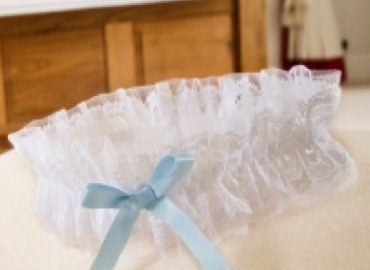 Each wedding garter is handmade in England from luxurious silks, tulles and laces. Embellished with hand tied bows, beading and crystals to create a sensational finishing touch. All of our garters are available in seven sizes to ensure a perfect fit. We beautifully gift wrap each garter in tissue paper and branded gift box. A beautiful collection of garters, made from super soft, luxurious, Italian tulle. Designs are embellished with striking details such as appliqués, silver threads, sequins, bows and beading to create the perfect wedding accessory. All of our garters are available in seven sizes to ensure a perfect fit. We beautifully gift wrap each garter in tissue paper and branded gift box. A collection of blue garters that are lovingly created in lace, silk or Italian tulle. Designs are embellished with beautiful blue details, crystals, bows and pendants. Perfect for that ‘Something Blue tradition’ a sign of love, purity and fidelity. 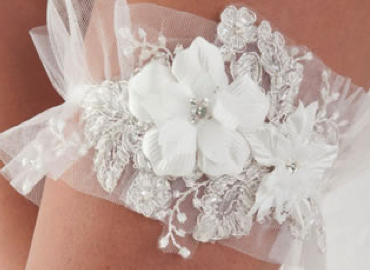 Our most desirable collection of wedding garters. Handmade from the most luxurious fabrics, laces and embellishments. If you are looking for a sensational garter and love extraordinary accessories this collection is perfect for you. 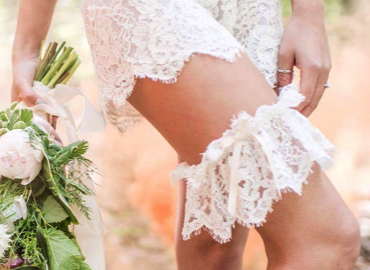 An exceptional collection of lace wedding garters. We use modern and traditional laces to create these stunning wedding accessories Our most sensational designs are made from Chantilly lace and Guipure with bow and crystal details. Perfect for the bride whose perfect wedding garter is not white or ivory. This collection is created in darker and brighter colours from silk, lace and Italian tulle with stunning embellishments. These garters are also an extra special treat for the wedding night or honeymoon.